MIQ Logistics provides logistics services throughout the different phases of a capital project, which help adhere to the project construction schedule, site rules, and project standards. Our logistics services will be tailored to the unique needs of your project. Situational analysis and extensive planning go into each step of every move we handle. Transportation engineering support and consulting. Analyzes the project in its entirety and provides guidance. Offshore and on-shore simulation. Identifies the most cost-effective and efficient international transportation network. Comprehensive risk assessment. Focuses on health, safety, loss prevention, compliance, sub-contractor quality management, infrastructure, resources and identifiable bottlenecks and/or congestion. Port, infrastructure and inland-route surveys. Identify all related logistics network elements and, as necessary, resolve issues associated with transporting cargo to its final destination. Site and marine surveys. Analyze vessel safety and seafloor qualities that could affect the safe passage of the cargo. Logistics supplier and subcontractor assessments. Use pre-defined standards and criteria for selecting on-shore project-execution partners and subcontractors. 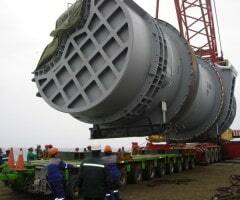 Heavy-lift and out-of-gauge cargo feasibility studies. Identify and document specific transportation and handling requirements and permit requirements for heavy-lift and over-dimensional cargo. Global materials management planning and project-execution support. Aids in development of INCOTERMS agreement, SOPs, handling and storage requirements, and IT interface requirements for shipment visibility. Project logistics budget development. Estimates freight costs throughout the lifecycle of the project. Coordination of all activities associated with the movement of equipment and supplies to comply with project standards and timelines. On-site supervision. Places experienced project managers and staff on location and available to oversee move. Heavy-lift and out-of-gauge cargo support. Secures permits for heavy-lift and over-dimensional cargo. Customs clearance design support. Aids with clearance procedures throughout the entire process, at origins and destinations worldwide. Timeline and completion rules. Predetermined rules guide when to expedite shipments. International freight forwarding and 3PL services. Provide access to reliable transportation capacity, in-country expertise, and state-of-the-art technologies. Expediting, coordination, support and status updates. Expedite shipment delivery through direct coordination with materials and equipment suppliers, and monitors and reports any slippage. Material receipts, line-item checking and verifications. Include physical inventories and damage assessments carried out by MIQ Logistics; we also handle cargo discrepancies with suppliers. Export and import controls. Classify materials, identify those requiring export licenses and make certain all import requirements are met prior to export. Documentation processes. In addition to shipping compliance, ensures all documents match purchase order specifics. Export packing and preservation. Devises solutions for damage-free moving of over-dimensional or sensitive cargo and minimizes space utilization. Carrier mode, transit-time and budget confirmations. Review of our air, sea and land freight, and vessel/aircraft charter recommendations to confirm alignment with project requirements. Heavy-lift and over-dimensional transportation. Provides equipment inspection, transport engineering of lift, sling and shackle requirements, and on-site representation during loading and unloading. Hazardous materials. Packed separately, marked according to codes and travel with supplier-completed materials-safety data sheets. Customs clearance services. Include broker services, where applicable, the securing of certifications and legalization of import documentation, coordination of cargo release, temporary warehousing, and transportation to the job site. Line-item tracking and tracing. Allows visibility throughout the move and alerts you to possible delays. Labeling and marking activities. Designed to maintain visibility and efficient handling of shipments as it relates to purchase orders; include material receipt labels, package labels and material receipt worksheet reports. Transition management during final phase of a project to ensure logistics processes are in place for on-going operations. Demobilization support. Manages temporary import regulations and licenses. Project closure plan. Transfers logistics resources, budgets, contracts and assets from the project to the asset as the project moves into the operational phase. Provided through all phases of a project as it relates to the supply chain. Regional dedicated project/account manager(s). Assigned overall responsibility for managing work on your behalf. Key performance indicators (KPI). Predetermined with the customer and monitored throughout the move. Reports and audits. Provide summarized and detailed information regarding performance, compared to key performance indicators. Progress meetings and business reviews. Held periodically, review report results and discuss problem areas and their causes and solutions. Project timelines. Establish key milestones to ensure all logistics activities deliver material on time and comply with customs regulations. Safety work rules and regulations. Closely followed; considered of paramount importance and foundational to our company’s values. Project end review. Final review of key performance indicators, cost reporting, project timelines and other project-specific information to make sure all expectations were met.